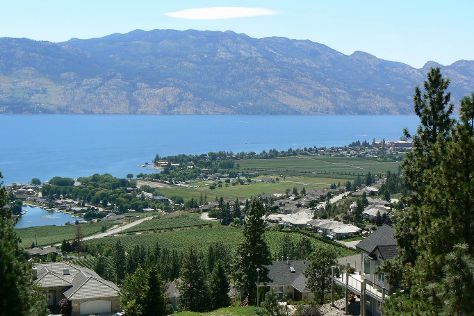 At the heart of British Columbia's wine country, Kelowna is at once both urban and rural, featuring a modern downtown encircled by picturesque hills carpeted with vineyards and orchards. The city's waterfront location makes it a major tourist destination, offering active vacationers a chance to sail and swim on a 130 km (80 mi) long lake. Kelowna makes an ideal base for touring the surrounding wineries and golf courses, located near small communities known for producing world-class artisanal cheeses. If you time your Kelowna vacation for winter, you can take advantage of the nearby ski resorts, a huge draw for lovers of snow sports. Kelowna is in Okanagan Valley. Ask Inspirock to suggest an itinerary and make planning a trip to Canada fast, fun, and easy. Downtown is considered the most desirable area to stay, with several hotels backing onto Kelowna City Park and offering views over the lake. The southern lakeside suburb of South Pandosy and the inland neighborhood of North Central also offer a range of accommodations, which cater to those looking for a genuine taste of Kelowna. If you have a car, you can stay at one of the roadside accommodations in Dilworth-Enterprise or Leathead.